DatingForSeniors is one of the most popular senior dating sites. Its streamlined design has attracted a large number of senior singles who would like to find someone special to grow old together. This site identifies visitor’s location automatically, so you’ll see many local users who are near you when you visit DatingForSeniors.com for the first time. That means this online dating service is very well designed. It also allows members to search other users by category, e.g. browse by women, browse by men, browse by type and browse by feature. Therefore, it has a lot to offer. DatingForSeniors.com has a large number of American members, but recently, it has started to attract international members as well due to its fantastic services. It allows visitors to view members’ profiles without registration. Yet its registration process is very simple - you just need to create a profile within a few minutes and you are ready to look for love online quickly. Overall, its features are outstanding and its pricing is reasonable, thus we recommend this service to senior singles. Browse profiles for free: You don’t even need to have a profile in order to view other members’ profiles. But if you want to check the last time a user logged in, you need to purchase a paid membership. Then you will see whether a profile is inactive or not. 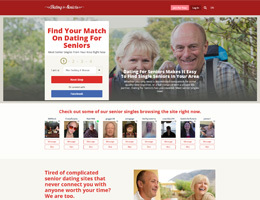 Permanent profile: As long as you have a valid email address, you can join DatingForSeniors.com easily. Then you will have a permanent profile online. But if you want to delete your profile, you can do that too. 3-day trial: Because a free member can’t do much on this site, you can have a 3-day trial for only $7.95 (just the cost of two cups of coffee). With a 3-day trial, you will be able to use all features that a paid membership can enjoy. Then you will see whether this service is right for you or not. Search: Free members can search other members online by using a range of criteria and filters. But if you’d like to use more advanced search functions, you should purchase a paid membership. Then you’ll search members in detail. Rapid match: This site shows you the profiles of your potential matches, then you’ll decide if you want to meet that user - options include YES, NO and MAYBE. Little black book: View other members’ private photos if they allow you to do so. Communication options: Flirt, email, instant messages are all available. There is a public chat room, too. Invisible mode: If you want to visit someone’s profile repeatedly, you may choose invisible mode so that they won’t know you are looking at their profile all the time. Great functions to help you take control of your dating life - little black book, rapid match, etc. are all amazing features that are not common on other senior dating sites. High quality members - this site has many high quality members who are passionate about dating and life. They are energetic and positive, as evidenced by the beautiful ambience on this website. There aren’t enough active users in the chat room, which probably means the overall number of users isn’t that big. Although DatingForSeniors.com has less members than other big senior dating websites and most of its members are in the United States, this site has some unique features that are enjoyed by its members. Its customer support is available 24/7, so you know this site is there for you when you need any help. In general, DatingForSeniors.com is a valuable senior dating service that is highly recommended by experts.